April 04, 2018, 8:43 a.m.
Danish beer brand Carlsberg has announced plans to continue its efforts to transition into a “premium beer brand” over the next year. The brewing giant is aiming to follow up on the success of its rebrand of Carlsberg Export by taking new approaches to its original Carlsberg brand. But, with overall UK lager sales down seven per cent, will it work? YouGov Brandindex data indicates how its consumer perception holds up compared to the competition. 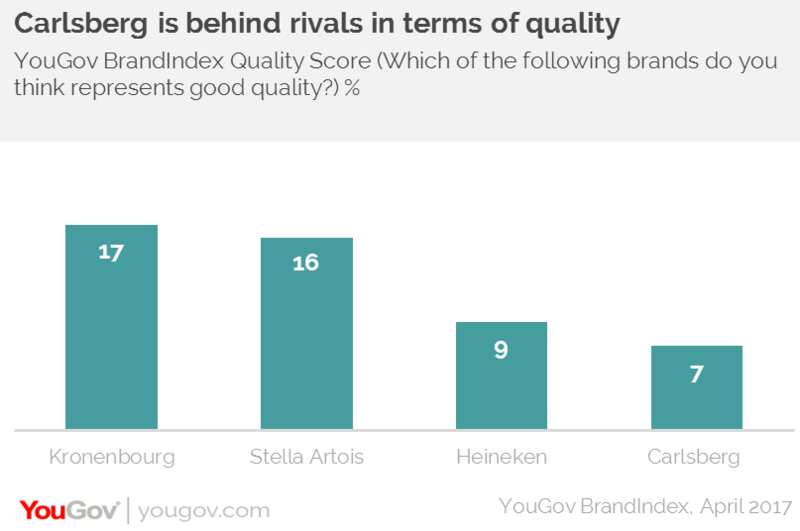 Carlsberg’s Quality score currently stands at seven, which puts it behind rivals such as Heineken (nine), Stella Artois (16) and Kronenbourg (17). In recent times, Carlsberg decided to move away from football sponsorship, ending its 22-year association with England’s national team. Instead, it is increasing its spend on music festivals. Our data suggests that Carlsberg is right to try and appeal to this demographic. YouGov Profiles data show that among regular or occasional festival goers, the brand’s positive Impression score (the percentage of those who have a positive view) stands at 18. It does lag behind other beer brands such as Heineken (22), Kronenbourg (22) and Stella Artois (27). The good news for Carlsberg is that it remains a popular choice among those who regularly drink lager in the pub at least once a month. Its Purchase Consideration score among this group is 23, meaning it is competing well with many of its rivals – with Heineken (22) and Kronenbourg (23) showing similar scores. However, Stella Artois is ahead of these brands on 32. Of course, the lager market is extremely competitive. Many pubs are closing, while there has been a dramatic influx of independent, niche craft beers entering the market and providing even greater choice for consumers. With this in mind it’s as important as ever for multinational conglomerate beer brands to target drinkers effectively, and ensure their positioning is successful. Whether the Carlsberg brand can be rejuvenated, especially among the modern lager drinker, remains to be seen.